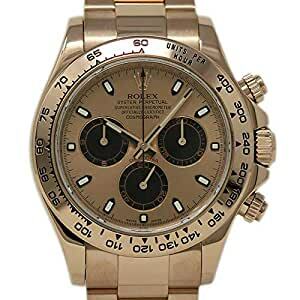 ROLEX DAYTONA ROSE CHAMPAGNE DIAL 18K ROSE GOLD BRACELET 116505. 18K ROSE GOLD CASE WITH A 18K ROSE GOLD BRACELET. ROSE CHAMPAGNE DIAL WITH GOLD-TONE HANDS AND INDEX HOUR MARKERS. MINUTE MARKERS AROUND THE OUTER RIM. DIAL TYPE: ANALOG. LUMINESCENT HANDS AND MARKERS. AUTOMATIC MOVEMENT. SCRATCH RESISTANT SAPPHIRE CRYSTAL. SOLID CASE BACK. CASE DIAMETER: 40MM. ROUND CASE SHAPE. DEPLOYMENT CLASP. WATER RESISTANT AT 100 METERS/ 330 FEET. SERIAL: M, CIRCA: 2008. COMES WITH ORIGINAL BOX AND PAPERS. WE WILL PROVIDE YOU WITH AN INVOICE FROM OUR STORE, ALSO A 2 YEARS WARRANTY ON ALL LABOR, AN APPRAISAL FOR INSURANCE PURPOSES.. BUY WITH CONFIDENCE KNOWING EACH TIMEPIECE GOES THROUGH THE SAME RIGOROUS 31-POINT INSPECTION. REST ASSURED ONLY AUTHENTIC PARTS STRAIGHT FROM THE MANUFACTURER ARE USED. THE CERTIFIED PRE-OWNED PROGRAM ON AMAZON ENSURES PEACE OF MIND AND TRANSPARENCY VIA STANDARDIZED REPORTS AND A 1 YEAR WARRANTY PROVIDED BY WATCHFACTS.